Wash well and soak all the dals in water for thirty minutes. In a pressure cooker take a table spoon of oil, heat it and add cumin seed. When the seeds start cracking add asafetida fry it for few seconds till asafetida turns light pink in colour. Add the dals, turmeric powder, chili powder, salt and ginger in the pressure cooker on high flame. The moment pressure is formed switch off the stove. Let it cool to room temperature. Open the lid of the pressure cooker, if the dal mixture looks a bit thick, then add some water slowly and stir to get a thick pouring consistency in the dal. Take another pan, heat ghee, add the cloves, green cardamoms, garam masala powder and crushed garlic.Fry them till they are fragrant. Now add this fried tempering mixture to the dal, mix well. Simmer the dal for 10 minutes or so that the flavours of the spices blends well with the lentils. 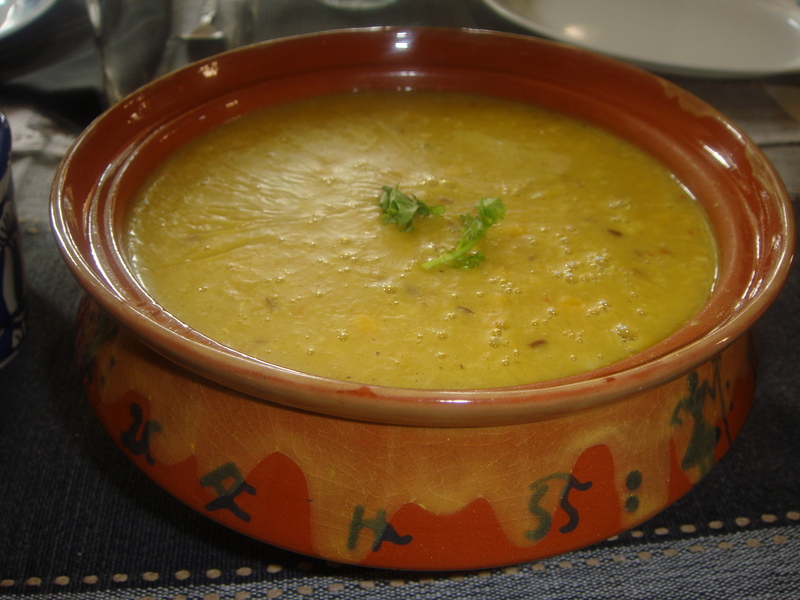 Serve hot, garnish the dal with coriander leaves. Panchmel dal goes very well with tandoori rotis ( Indian bread baked in clay onen), rice dishes. This recipe for Mixed Dal is very tasty and it gives energy. It is also very nourishing due to its high protein and brings deep nourishment to the tissues (dhatu). Dals are very commonly used in the Indian cuisine. It is hard to find an Indian household that does not stock up different types dals. As dals have to prepared on a daily basis, we need to have a lot of dals on board to maintain the variety. Besides dals are types of pulses that have many nutritional values. The health benefits of dals in general is that they are very rich in proteins. As many Indians are vegetarians, these different types of pulses provide them with main source of vegan proteins. That is why, all the different types of dals are very important for the typical Indian diet. Apart from the general health benefits of dals, each type of dal has its own set of nutritional values. So it is advisable to have a mix of all these dals in your diet. Some types of dals are healthier when compared to others. For example, the black gram dal and moong dal are hailed has the healthiest among the dals. Others like masoor dal have health benefits too but they also have some side effects. For example, masoor dal raises your uric acid levels so you must limit its consumption. So here are some types of dals and their exclusive health benefits. Chana dal or Bengal gram dal is one of the richest vegan source of dietary proteins. It is also rich in trace minerals like copper, manganese etc. Having this dal helps keep diabetes at bay. Moong dal is a dieter friendly dal. This type of dal has minimal calorie and is a rich source of iron and potassium. Masoor dal is very good for people suffering from bile reflux, and it also improves the blood circulation in the body. Urad Dal If its proteins you want from your meal, then opt for urad dal. This dal is one of the richest sources of proteins and Vitamin B.
Toor Dal is one of the most popular dals eaten in India. This dal has immense amounts of complex dietary fibres that helps to regularize bowel movements.